Paranormal Activity: The Ghost Dimension opens tonight and 15 theaters across the nation will have the Paranormal Activity VR demo ready to try out. Shacknews recently had the opportunity to see some of the frightening imagery for ourselves. The Paranormal Activity film franchise is set to continue on with its latest installment this year, Paranormal Activity: The Ghost Dimension. But moviegoers are going to find a little extra at select theaters. Developer VRWERX has put together a short demo for the Paranormal Activity VR game and will have it on display at select AMC theaters. Not ones to pass up a chance to be scared out of our wits, Shacknews recently went eyes-on with the short demo using an HTC Vive. The demo doesn't take long remind users just what kind of experience they're in for. Upon loading into an abandoned house, the player can find a girl crying in a distant corner. 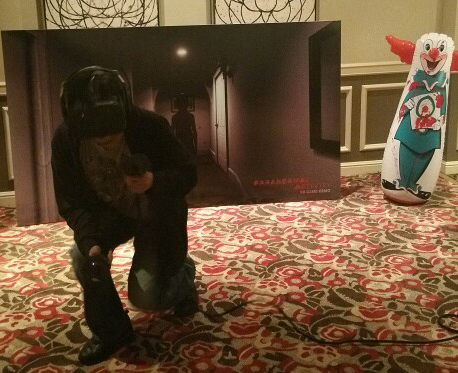 Walking towards her will quickly trigger one of the many jump scares that pop up throughout the demo. The girl vanishes, leaving players to walk into the nearby bedroom, where there's a mysterious tent in place. At this point, the idea is to hunch down and move into the tent, emerging along a different side of the house on the other side. This is where the scares start to kick in, as walls start to shake, paintings begin to fly off the wall, windows rattle, and loud explosions are heard outside. The louder the explosion, the more that bursts of blood seep in through the cracks. Prior to entering the last door, knives cut through the closet door on the side. And upon entering the last door, the little girl from the start of the demo falls through the ceiling, an unseen spirit keeping her afloat and sending her violently flailing across the room, back and forth. Paranormal Activity: The Ghost Dimension opens tonight at 7PM and the Paranormal Activity VR demo will be available at each of the aforementioned locations when the movie opens.